Hello readers! Welcome to the first edition of the UP Dog Blog, where you’ll find advice about dog training, health, wellness, and other canine-centered topics. Whether you’re an Uptown client, love learning about dogs, or stumbled here by accident, we hope enjoy this page and use it as a way to enrich the life of you and your pup. First, I’d like to share a little bit about myself. My name is Jimmy Maxwell, and I live in Speedway, Indiana. I was born and raised in Bloomington, where I attended Bloomington High School South. Not long after high school, I was hired by Youth For Christ (YFC) as the Campus Life Director of Owen County, ministering to the town of Spencer. If you don’t know where that is, I don’t blame you. 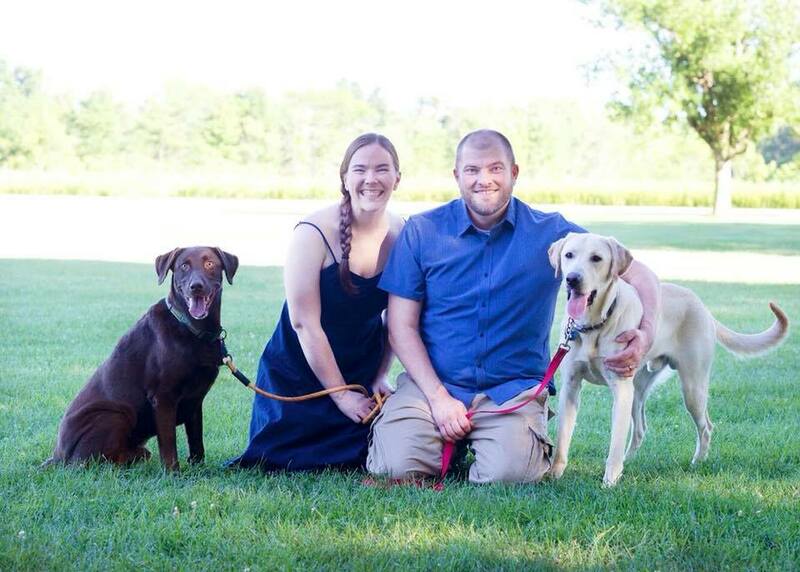 During my time at YFC, I married Kelli, and in 2010 we got our first dog, a Chocolate Lab named Lambeau — a gift to Kelli upon graduating from Indiana University (go Hoosiers). Through crazy coincidence, Kelli and I introduced Lambeau to the world of Search and Rescue (SAR). Not only did he take to the work like a duck to water, but I found my calling. After gaining experience in SAR, I left ministry to pursue my degree in Homeland Security & Emergency Management, while working a number of different jobs and learning everything possible about dog behavior and training, shadowing other dog trainers, and scouring lots of material. In 2015, Kelli, Lambeau, and I transitioned to Indy and joined Midwest Search Dogs (MSD). I continued learning all I could while working at a local Chipotle to put myself through school. We bought a house in Speedway in 2016, and I was offered a position at a local service dog training company, Medical Mutts, where I received constant and steady hands-on experience training service dogs in multiple disciplines. After a year and half, I met the great people at Uptown Pup and accepted their offer to help dog parents like you create happy pups and happy lives. After finishing my degree, I left Medical Mutts in early June of 2018 and became Lead Trainer at UP. Kelli and I still live in — and love — Speedway, where we’re close to the action every May. We’re both die-hard fans of the Green Bay Packers, Indy Car Racing, and being outdoors in nature. Lambeau is still a certified live-area SAR dog, but at 8 years is starting to show his age. We’re currently training his replacement, Copper, a 1-year-old Yellow Lab beast who packs the punch of two dogs in one. Through this blog, you’ll get a chance to meet my dogs, learn some lessons I learned the hard way, and gain an understanding of my training philosophy. There are a few rules I set for myself as a trainer. The first: I don’t guess. The second: I speak from experience. There are many conflicting training methods on this planet, and I’ve used a lot of them. The wrong methods have lasting negative impacts, and the right ones set your pup up for success and happiness. This is my guiding philosophy when teaching UP classes, clients, and pups. When I don’t have an immediate answer for a dog or their owner, I dive into scientifically proven research and contact specialized trainers on the subject. Because sometimes it takes a village. In any case, I promise to do everything in my power to help you meet your training goals, whether it’s in a group class, a private session, or just sharing my thoughts on this blog. Stay tuned for more from the UP Dog Blog!